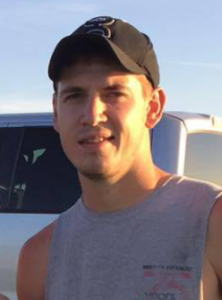 HERINGTON – Aaron Wesley Biehler, departed this life Saturday, May 27th, 2017. He was born on May 28, 1993, at Herington, the son of Ronald J. Biehler and Elizabeth A. (Tindle) Miller. Funeral Service will be 11:00AM, Wednesday, May 31st, 2017, at the Herington Community Building, with Rev. Sue Talbot and Rev. Mark Lovett, officiating. Military committal will follow at the Burdick Methodist Cemetery. A visitation will be 6:00 – 8:00PM, Tuesday, May 30th, 2017, at the Zeiner Funeral Home-Herington. He was confirmed at the Herington United Methodist Church and graduated from Herington High School with the class of 2011. He was currently serving in the Kansas National Guard and presently employed at Pyrodex Corporation. He enjoyed fishing, hunting, and outdoor activities. He is survived by his father Ron Biehler (wife-Cindy) of Herington; his mother Betsy Miller (husband-Kent) of Rossville; a daughter Paisley Biehler of Marion; his siblings Ashlynn Biehler of Topeka, Brady Miller of Rossville, Lana Miller and Coty Miller (wife-Tori) of Herington, Ashlee Tomasic (husband-Ian) of Kansas City, KS, Chandler Kickhaefer (husband-Nate) of Merriam; paternal grandparents Jim and Metta Rae Biehler, Lonnie and Jeanie Schneider of Herington; maternal grandparents Jack and Nancy Riggin of Burdick, James and Carol Miller of Delavan; and a maternal great grandmother JoAnn Stevens of Satanta, KS. The family requests memorials to Aaron Biehler Memorial Fund; and they may be sent in care of the Zeiner Funeral Home, Herington.